We managed to get away from the ER for a few minutes to snag some dinner. We did our typical Sunday run to Chipotle. I had my usual burrito bowl and I’, proud to note that I only wind up eating about 1/3 of the meal. I don’t know how I used to managed to eat a whole bowl, along with a half a bag of chips AND two sodas. Anyway, SPW wasn’t working yesterday, so we were going to consider going to a movie. You know, kind of a date night sort of thing. Timing got screwed up, so we wound up taking advantage of a free burger at Red Robin coupon that I had gotten for my birthday. I ordered my usual, a bacon cheeseburger with provolone on a ciabatta roll. I also opted for a cup of chili. I did get fries with my burger, so not the healthiest choice, but when all was said and done, I left about half the fries on the plate, as well as ¾ of the bun. Again… this is usually a place where I’d scarf the burger AND fries, then order more fries. I am making some progress. After that, we paid a visit to the pet store, just to look at the bunnies. I know it chips away at my manly cred, but I do have a weakness for cute animals, and, well, there was one that I just wanted to take home. He (she?) had an on hold tag on the pen, though, but his little lop ears were just begging to be snorgled. 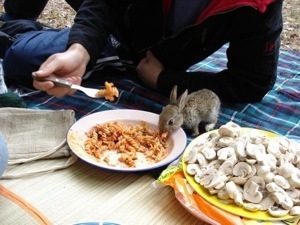 There was also a dwarf bunny that reminded me of a pic I had seen on Cute Overload. I’ll post it along with this entry. So, moving on into today, I had a really good workout. 47 minutes, averaging 3.00 mph. I did the first five minutes at 2.5, then the rest at 3.1. It was my best average speed yet. I would like to get to a point where I can do the 3.1 for an entire hour. This will make the 5K more palatable, if I can get it done in under an hour. I hope that once I’m free of the 160 pounds of excess weight, I will be able to walk faster and have that much less pain in my joints. One of the cool features of the treadmills at the rec is that they have a USB port on them. You can attach a thumb drive and store your workouts and results. Supportive Partner Woman went to a conference last year and came home with a really cool promo flash drive that she gave to me. 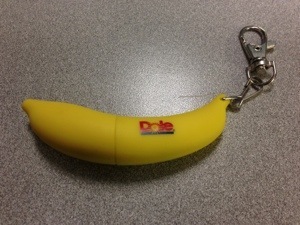 It’s from Dole, and it’s shaped like a banana. There’s also a keychain attached to it, so I can keep it attached to my gym bag. It works perfectly and allows me to track all my workouts at the LifeFitness website. This should make it easy to see how much progress I’ve made. Technology win? I think so. So, all in all, a good couple of days on the workout front. I gained a notch in my belt as well and I think I’m getting closer to the first goal shirt. I might even fit in smaller jeans soon. I’m also pleased to report that I’m now a week without soda and I’m trying to wean myself off of artificial sweeteners. This will be an interesting process to say the least. But, if I can get off of soda, I can beat anything. Keep up the great work my friend! Very, very proud of you!! Day four, or I want pizza, dammit!